When we think about nursing home neglect, we often think about bedsores and malnutrition, not about slip and fall injuries. However, it is absolutely vital to understand that slips and falls are often completely preventable. In fact, if your senior loved one has been seriously injured due to a nursing home fall, it is possible that his or her home was negligent – and that your family deserves compensation. According to the Centers for Disease Control and Prevention (CDC), about 1,800 residents die every year from fall-related injuries. Residents who experience non-fatal injuries from their falls are often left with permanent disabilities and a significantly reduced quality of life. A nursing facility patient falls an average of 2.6 times each year. An estimated 20 percent of nursing facility falls result in serious injury. While only five percent of seniors live in nursing homes, these residents account for 20 percent of total senior fall-related fatalities. For a home with 100 beds, 100-200 falling incidents are reported each year. Many more falls go unreported. An estimated 50 to 75 percent of elder residents fall every year, while seniors living in private residences experience only half that number. Up to 6 percent of elder facility falls result in bone fractures. As you can see, fall injuries are a serious problem – and a problem that is not managed successfully by many elder care facilities in the United States. If your loved one has been hurt in a fall, he or she might be eligible to receive compensation. Contact an experienced Kentucky nursing home neglect attorney today for a free and confidential consultation to discuss your case. How Serious Are Fall-Related Injuries? Fractured bones, especially broken hips. Head injuries and traumatic brain injuries. In turn, broken bones and head trauma can lead to even more complications for seniors, such as infections, bed sores, and permanent disability. In too many cases, a serious fall and its complications can lead to death. Even if a nursing home patient survives, he or she might suffer lasting injuries and a greatly reduced quality of life. How Do Nursing Home Falls Happen? Understaffing. Understaffed elder homes mean unsupervised seniors. These seniors may be forced to engage in activities that are not safe (going to the restroom, bathing, or leaving their bed) without assistance. Poor staff training. Poorly trained nurses and nurse assistants can be just as dangerous as no staff at all. They can drop patients, ignore patients, or not give patients the proper help that they need. They may also have an improper response to a fall. A dangerous nursing home environment. Your senior loved one may have fallen because of a lack of safety features, such as bed railings, bathroom railings, or floor pads. Or your senior could have tripped on carpet, an unsafe stairwell, or other hazard. It is the nursing home’s responsibility to keep their environment safe for both residents and visitors. Nursing home abuse. In some cases, a resident may suffer a fall because they are the victims of abuse; for example, they were pushed by a staff member or purposefully left alone in the bathtub without assistance. It is imperative to understand how and why your loved one’s fall took place – and whether the injury was treated correctly after the fall occurred. A Kentucky nursing home negligence attorney can help you understand your case and explain whether or not you may be able to seek damages. 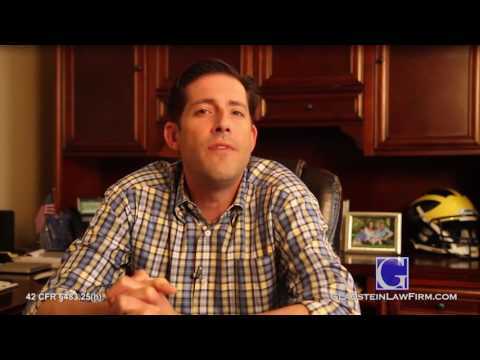 At Gladstein Law Firm, you’re more than just a statistic. We don’t engage in high-volume law like our many counterparts. Instead, we limit the number of clients we take on because we believe every client deserves our full attention and the full weight of our experience and resources. If you or a loved one has sustained a serious fall, due to nursing home negligence or neglect, give our experienced injury attorney a call today for a free complimentary consultation. Do it for your senior loved one and for residents across the country. Seth Gladstein will fight with you to pursue justice and the compensation that your loved one needs to recover.